Starting in July 2015, our server just uses SFTP and not regular FTP. This change will make passwords more secure since they’re sent using SSL encryption instead of in the clear. This article will explain using SFTP with our server. We’re actually using FTPS, which is FTP over SSL for all accounts (most FTP programs call this SFTP, so it can get confusing). We do have SFTP (using SSH) available for some accounts. Note: If you get a message about the certificate not matching, then it’s probably ok. You should see one for “web8.webstix.com” if your website does not have its own SSL certificate. Just accept it or click connect. For websites, all the website files are typically in the “httpdocs” folder on our servers. Click on the “New Site” button and type in a descriptive site name. In the “User:” box, type in: Your FTP account username. In the “Password:“ box, type in: Your FTP password. Note: You can find the Username and Password on the launch email which we sent. Click on the “Connect” button to connect through SFTP. 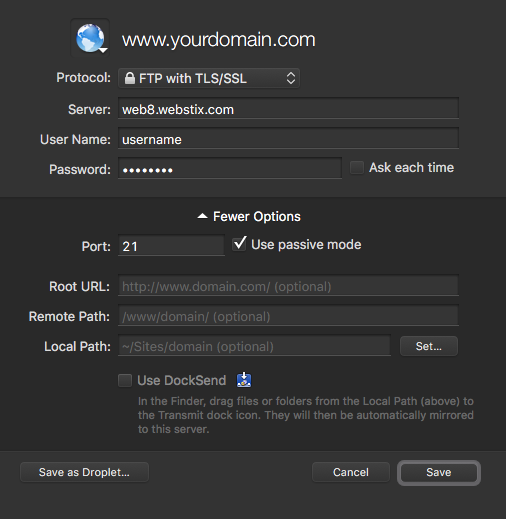 Set up a new site and follow the settings we list above (port 21, FTP with TLS/SSL, passive mode) and you should be good. How Do I Make My Website Secure?